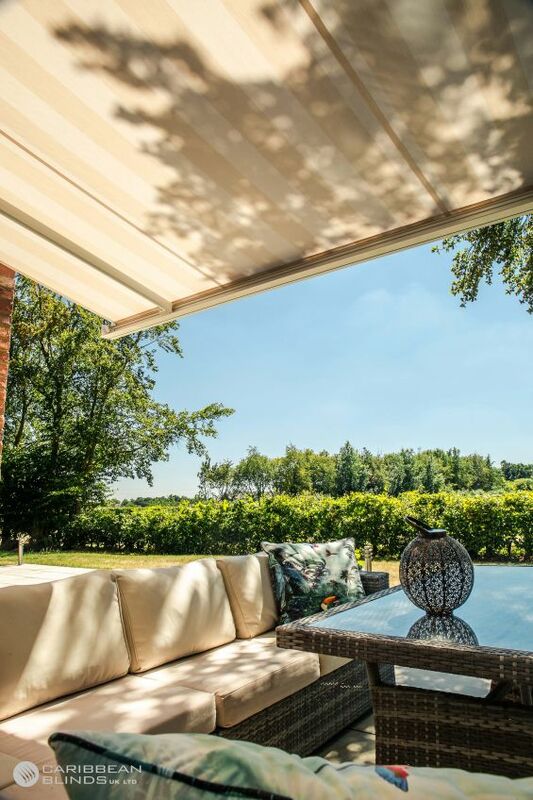 Our Digital Team took a trip to Roydon in Essex to visit our wonderful clients to photoshoot their stunning two Cuba Awnings situated at the back of their spacious garden. The clients have a large patio area with lots of potential for additional outdoor features to enhance their garden space further. What they had in place already was enough to make the most of outdoor living, especially now they have two retractable awnings to take advantage of and extend their dedicated outdoor living area. 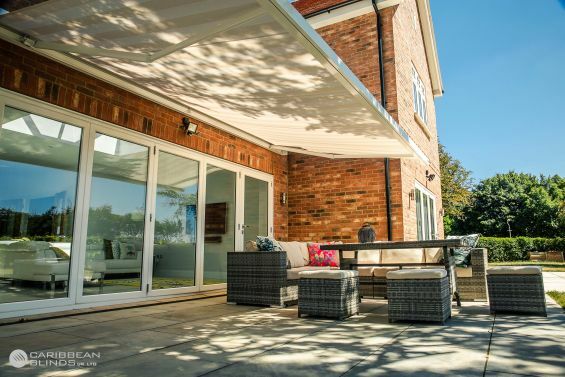 What makes this particular projects special is these two Patio Awnings are fixed right above the bi-fold doors to extend the living space naturally from the internal to the external, which is something that we were keen to highlight. Using a Garden Awning in this situation enhances the living space by providing sheltered areas just in front of the glazed doors so that they can add outdoor furniture to relax and enjoy the outdoors. The combination of the bi-fold doors and awnings will make you feel as if you never left the house but only with the added comfort of the natural breeze stroking your skin. The other added benefit of applying our contemporary awnings to this building design is that it is able to provide protection to the glazed area from the suns intense heat. 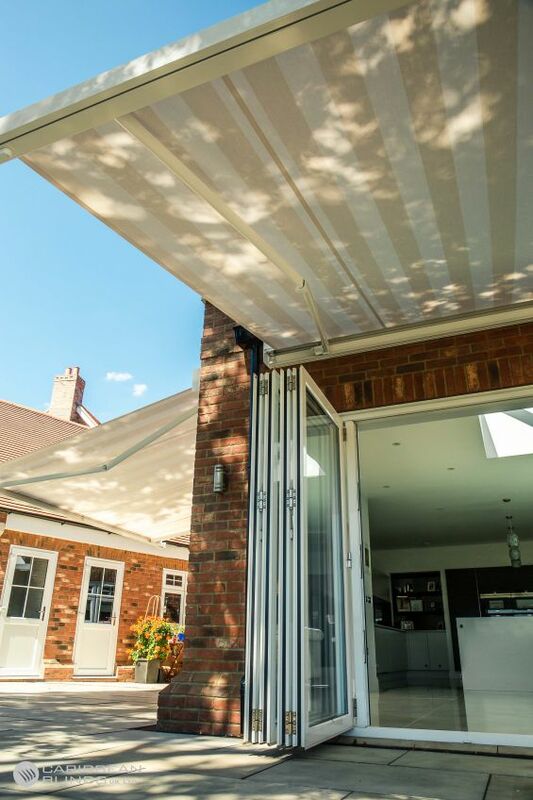 The large projection and weatherproof fabric will provide sufficient shade to deter the harmful rays from making contact with the bi-fold doors which will prevent solar heat gain in the internal space, keeping it cool and comfortable. 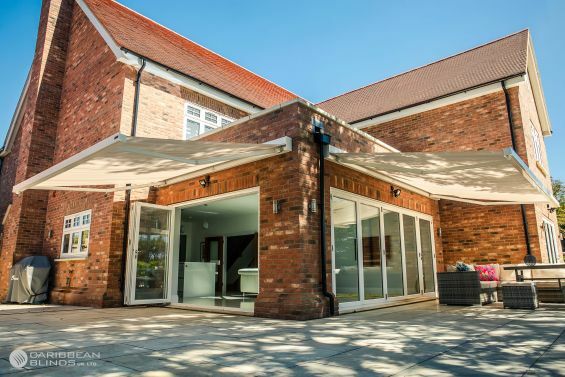 Our awnings are designed to provide outdoor living whilst providing protection which is why these shading systems are a popular solution among home owners. 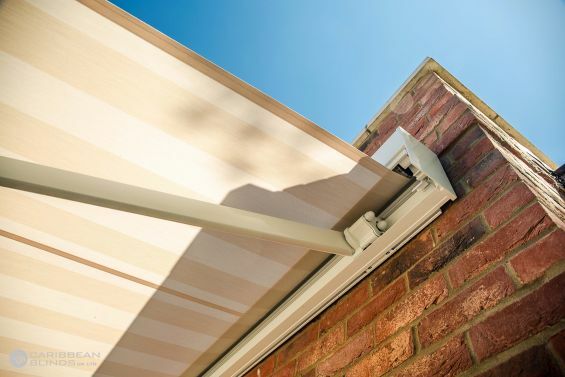 Each awning is manufactured here in the United Kingdom by our specialist Shading Technicians, our team of designers will work with the clients to create an awning design that coincides with their existing features. On this occasion the clients have gone with a white hardware colour and a cream and white fabric stripe, as you can see from the images this works effortlessly with their building design. Our priority as Shading Specialist to ensure your home gets the adequate protection with the appropriate solution and we then combine that with the aesthetic options so that our clients get a unique design that works for them. If you would like to discuss your options then speak to one of our trusted advisers today on 0344 800 1947 or you can leave your details using our quick enquiry form and we will send you an inspirational product brochure highlighting more information.